Address: 2884 B 1/2 Rd. 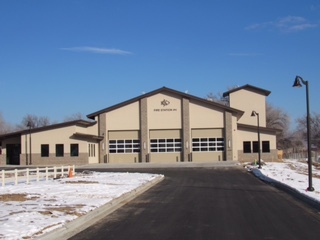 The new Grand Junction Fire Station #4 has been completed at 2884 B 1/2 Road and the firefighters will be moving in and operating at this location January 18, 2016. Fire Station 4 serves the City and Grand Junction Rural Fire Protection District, as well as supports Central Orchard Mesa Fire District, Land’s End Fire District and the Clifton Fire Protection District. The station was “relocated” from its prior location at 251 27 Road to enhance emergency service delivery in the southeast quadrant of the City and the rural fire district. Moving the station to the east provides a quicker response in Orchard Mesa as a whole, as well as the Pear Park area, meeting the emergency response needs of existing and future growth. The new station is larger and has the latest technology providing for current and future needs of the Fire Department. The vacated Fire Station 4 building on 27 Road will be put to good use as a new satellite location for the City’s Public Works Department, enhancing wastewater services to Orchard Mesa. 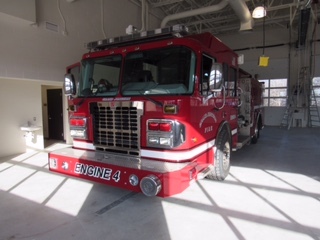 The public will be invited to an open house of the new Fire Station 4 scheduled in February. Previous postStructure Fire: 2875 C 1/2 Rd. Grand Junction, CO.